Ellesmere Ice Shelf in 1906. Vincent et al report findings as to the age and original persistence of this ice shelf citing Evans and England (1992) who found driftwood that indicated that the ice shelf first grew in response to a cooling some 4000 years ago. Jakobsson et al 2010 later confirm this, citing more research by England showing no driftwood after 5500 years ago. Vincent et al note the speculation as to what had caused the recession of this vast ice shelf, noting theories around tidal action, changes in winds, and even resonant vibrations in the ice sheet. Vincent et al figure 3. Thickness measurements of the Ward Hunt ice shelf in the 1950s found thicknesses of 43 to 54 metres thick. Airborne radio based measurements gave thicknesses between 25 and 80 metres in 1966, then 45 to 50 metres in 1981. In 1967 the depth of the freshwater layer in a glacial lake in a fjord behind the Ward Hunt ice shelf was measured as 48 metres, implying that the Ward Hunt shelf was of equal thickness adjacent to this lake. By 1999 this was profiled as 35 metres deep, implying around a 20% reduction in thickness of the ice shelf. As noted by Vincent et al, in the Antarctic Peninsular there has been substantial ice shelf loss due to regional warming, and the meteorological records from Alert (on Ellesmere Island) did not suggest a reduction in precipitation (snowfall). This suggested that the reason for the decline of the ice shelf was not due to a reduction in accretion (ice gain due to snowfall), but that the reduction was probably due to warming. Indeed the most striking loss of area appears to have been in the period between 1906 and the 1940s, which was probably due to the regional warming of that period. 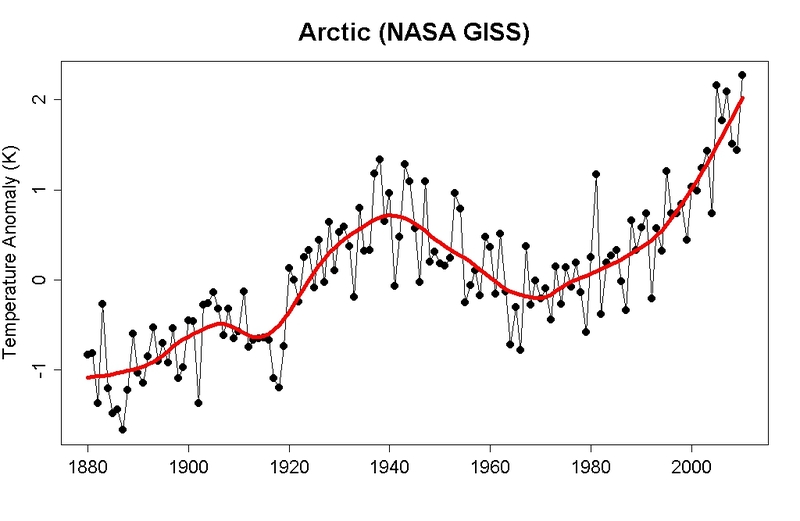 The Arctic is now warmer than it was in that period, e.g. Tamino. This fact alone suggests that whatever is left of the once expensive ice-shelves will not be there for much longer. Perhaps what is most striking about this paper is the context of the decade since publication, during which we've seen a substantial loss of both volume and area of Arctic sea-ice and a massive warming. For those who's prejudice means they don't like Tamino I recommend Bengtsson 2004 figure 1, which is Arctic temperature from Johanessen et al (see refs in Bengtsson et al). Or you could just refer to the graph below (black line is observations). Even more striking is how little of the ice-shelves are left now, 10 years on; Neven's Arctic Sea-Ice blog reports on their final decline here. With regards the massive loss of the Ellesmere ice shelf between 1906 and the 1940s, I'd better say a little more as I've touched on what I consider an important paper. Bengtsson et al propose a hypothesis to account for the warming, that it was due to internal variability in the Arctic climate system, with temperature amplification by loss of Arctic sea-ice. I find their arguments persuasive, rather than re-hash them I suggest interested readers refer to their paper. One additional piece of evidence I'd put forward in support of their hypothesis is Gillett et al. They carried out a modelling study that found "the observed changes in Arctic and Antarctic temperatures are not consistent with internal climate variability or natural climate drivers alone, and are directly attributable to human influence." Their approach is the classic, all forcings / natural only forcings approach. Gillet et al, figure 4 a. In the above plot the NAT and ALL solid lines show the ensemble mean for ensembles (groups) of model runs, over 20 in each group. The dahed lines are the highest and lowest ensemble members for the NAT and ALL ensembles. The black solid line is observed Arctic temperature. Concentrating on the Arctic (my pet obsession), as you can see the natural forcings (NAT) does not reproduce the recent warming. Whereas the all-forcings (ALL i.e. natural and anthropogenic) reproduces a warming at the end of the period, as is seen in the observations. What is striking in terms of the 1940s is that both NAT and ALL fail to reproduce the 1940s warming, individual ensemble members might, but not enough members for it to appear in the ensemble mean. This suggests to me that the 1940s warming was not directly an outcome of externally forced changes, external to the Arctic that is. Were it a feature imposed by forces from outside the Arctic it would appear in all/most ensemble members and thus would impact the ensemble mean. That it does not appear in all ensemble members is telling. This is the behaviour I'd expect to see if Bengtsson et al are correct; that the 1940s warming was an outcome of internal variability in the Arctic. Now in terms of the recent warming, this is modelled as a rise in the ALL forcings ensemble, because it's externally forced, not an outcome of internal variability. It could be suggested that poor model simulation of sea-ice may be the cause of failing to reproduce the 1940s warming. 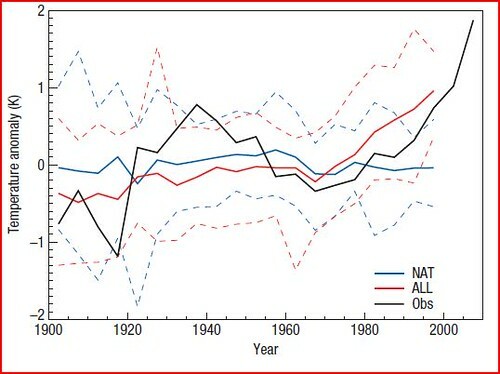 However if we're to view the sea-ice role as an amplifier, we should see an under-performance with regards the 1940s warming, we don't, we see a total absence in both NAT and ALL. That's before we get to the colder period before the 1940s, again as the model doesn't show it I'm suspecting internal variability of the climate in the region. Isn't this just defending a crap model? No. Because for the recent period where we know there's a massive forcing of origin external to the region (CO2 increases), the model shows a warming when this is taken into account (ALL), but doesn't when it isn't (NAT). Showing that the recent warming is due to human activities, and supporting the suggestion that the recent warming is different in nature to the past. Other research bears out this difference, for example Overland et al points out that the 2000 to 2007 warming period has a substantially different pattern to the earlier warming culminating in the 1940s peak. Bengtsson et al, 2004, "The Early Twentieth-Century Warming in the Arctic—A Possible Mechanism." Gillett et al, 2008, "Attribution of polar warming to human influence." Overland et al, 2008, "The recent Arctic warm period." Vincent et al, 2001, "Ice-shelf collapse, climate change, and habitat loss in the Canadian high Arctic." Between the periods 2004–2006 and 2007–2009, the rate of mass loss sharply increased from 31 ± 8 Gt yr−1 to 92 ± 12 Gt yr−1 in direct response to warmer summer temperatures, to which rates of ice loss are highly sensitive (64 ± 14 Gt yr−1 per 1 K increase). Given the rate of increase of warming in the region, and that this will accelerate as the Arctic continues it's transition, and the Canadian Arctic Archipelago exhibits more summer open water, the mass losses in this region will continue to accelerate. This isn't worth a post on it's own. I'll leave the link here as an 'easter egg' to this post for anyone needing some light relief. Gave me a chuckle.